Differential thermostat for control of solar panels and fireplaces with water jacket The differential thermostat is used to control the hot water flow between the solar panel / fireplace and the water heater by switching the electric tap or circulation pump. Temperature probe DS18B20, non-waterproof, 4m Temperature probe with sensor DS18B20, non waterproofed and 4 m long cable. Temperature probe DS18B20, non-waterproof, 2m Temperature probe with sensor DS18B20, non waterproofed and 2 m long cable. List Price 8.50лв. VAT Incl. 8.07лв. VAT Incl. Thermo Control Thermo Control has a digital LED display. It is suitable for temperature regulation in thermo chambers, rooms, incubators, etc. In the range of -55 ° C to + 125 ° C, with an LED alarm and buzzer for low and high temperatures if the temperature goes beyond the set limits. List Price 29.00лв. VAT Incl. 27.55лв. VAT Incl. Temperature probe DS18B20, non-waterproof, 5m Temperature probe with sensor DS18B20, non waterproofed and 5 m long cable. Thermoregulator Digital Differential Thermo, 12VDC Digital Differential Thermo differential thermostat is mainly used to control the hot water flow between a solar panel / fireplace and a water heater, etc. by switching an electric tap or a circulating pump. List Price 29.00лв. VAT Incl. 27.54лв. VAT Incl. 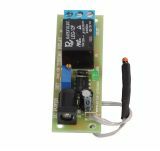 Thermostat Thermo Relay, 10 ° to 65 ° C, 250VAC, 8A The thermostat Thermo Relay is a relay output for AC load with maximum parameters 250 VAC 10 A. The thermal relay is suitable for bit incubator thermostat for tank thermostat for floor heating system. Thermostat Thermo Solid, 10° to 65°C, 250VAC, 8A Thermo Solid is a low-cost thermoregulator with an electronic galvanic split output for variable current load with maximum AC 250 V / 8 A. The device is suitable for a domestic incubator, an aquarium thermostat, a floor heating thermostat and more. Phase regulator Phase Regulator 4A, up to 800 W Phase regulator with a rated current of 4 A and an efficiency up to 97% . It is used most often as a regulator of speed for appliances and tools with electric motors. Fan rotation regulator SpeedFan This device can be used to control DC motors 12 V/ 2 A rotation speed. Thermoregulator +40 - +140C, 220V Thermoregulator kit №10B +40 - +140C suitable for keeping the temperature in this range in different installations and/or facilities. Thermoregulator +32 - +42 C, 220V Thermoregulator kit №10B +32 - +42 C suitable for keeping the temperature in this range in different installations and/or facilities. Phase Regulator 12 A Phase Regulator 12 A, with power for consumers 2500 W.
Temperature controller 3 КИТ-В807 The proposed device can be used to make a "domestic incubator" thermostat, an aquarium thermoregulator, a floor heating thermostat, etc. List Price 15.00лв. VAT Incl. 14.25лв. VAT Incl. Fan and motor speed regulator, 1000W Fan and motor speed AC regulator for up to 1000 W maximum load. Potentiometer on front panel for speed adjustment.